After drying, Western Red Cedar tends to be a uniform reddish-brown colour. Planed-all-round (PAR)Western Red Cedar is suitable for exterior cladding, greenhouses, sheds, bee-hives, shingles and light construction. The wood however is acidic and tends to corrode ferrous metals - protective coatings should be applied to metal fittings and fixings. 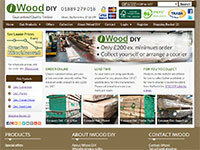 At iWood Timber Merchants we have built our reputation on supplying quality timber, ensuring you have the greatest % of usable Western Red Cedar Planed Timber possible from your delivery. Our Planed All Round Western Red Cedar is air dried to a moisture content of between 20 and 25%.